It's no lie that God of War has been around for a while now and with a total of seven (including the mobile game - God of War: Betrayal) released titles to date, it'd be understandable for fans to accuse Sony of milking the series, but is it really milking the series if there's still more story to tell? God of War has been one of my favourite series of all time. I hold it in extremely high regard and consider it to be almost on par with Capcom's most successful Devil May Cry titles. With the exception of Ascension (a prequel and the only God of War title I lost interest in), Kratos' path of destruction has taken the lives of countless innocents, Gods and Titans, so much so that he's actually run out of things to kill under the Greek mythos and so, Sony have ventured into the realm of Norse mythology with their upcoming reboot in the hopes of keeping things fresh, which looks to re-invigorate the series through clever use of storytelling. Plot and character development has always been one of Sony's strongest points when it comes to exclusive and AAA titles, so I'm incredibly keen to see what they do this time around. While strange to see Kratos away from his own realm, our favourite sharp-chinned Demi-God has a whole new set of Deities to maim and murder, now accompanied by his previously unseen son, Atreus. From the trailers alone, it's clear that we're seeing the Ghost of Sparta in a new light for the first time ever, bringing with it a fresh new experience to fans already aware of the God killers previous undertakings. It's not just about Kratos anymore. Family means a lot to this man and as such, the time has come for Kratos to push aside his barbaric tendency to kill anything and everything within sight, embracing a more calculated and methodical approach, fully aware of the fact he'll need to nurture and train his son in the years to come if he truly wishes for his own flesh and blood to survive the ever-present cruelty of the world (even if he somewhat lacks the patience to do so). As a fan of Norse Mythology myself, I'm incredibly interested to see what Sony's Santa Monica Studios can do with the series. In the trailers shown so far we've seen a Giant, a Dragon and even the World Serpent. The scale of this game already looks ridiculous, but then what would we expect? This is a brand new God of War being developed as a reboot from the ground up on a still relatively new console. New tech means new possibilities and fans of the series should know by now that the developers behind God of War have always tried to go bigger and better with every new release. The next God of War should be no different. From the trailers alone, it's clear that Kratos is now within a much more mystical realm and as strange as it may be to see him surrounded by Fae, considering the environment, I really don't feel he'd be too out of place here. We have little to go on at this point, but I find it impressive that even in such a vastly different setting, the grittiness is still very much there and with the magical undertones seemingly imbued throughout the adventure, I feel we've got a lot to look forward to. After all, this isn't the unstoppable Kratos we're all used to seeing. This is a hardened, older warrior, likely tired of the inescapable torment and troubles he always seems to stumble across. Armed with a magical returning Axe (named Leviathan), our ashen anti-hero already has a trusted sidekick - his weapon. How did such a unique weapon find itself to Kratos? Who will be aiding a man as ruthless as he? What greater purpose does Kratos serve here? All will be revealed come next year, but we have to keep in mind everything we've seen is there for a reason. The woman advising Kratos, his son, the World Serpent? There's a bigger picture here and although I have every bit of faith in this beautifully detailed re-imagining of the series, I also have my concerns. Possibly an even greater story to tell than the original trilogy, this God of War seems to heavily imply Kratos' journey has almost reached its end. The man himself is still an undeniable badass, but there's an unusual calmness to him previously unseen before. Perhaps it's because his son is now in the picture, but more likely is the possibility he's grown tired of war and now wants to pass his knowledge and experience onto his son, Atreus, before retiring as it were, from war. As previously mentioned, Sony are usually on point when it comes to their ability in creating believable, rich and immersive worlds. Their storytelling abilities are incredible and because Kratos has already lost his family and every other person who ever grew close to him, it makes sense to pass the mantle onto his son. It's unlikely we'll be seeing the same thing happen to Kratos again and so, the most logical answer here is that we'll be spending a great deal of time forming an attachment to his son as we aid and guide him throughout Kratos' new adventure until finally he's as able as Kratos once was during his glory days. At this point, I see only one thing happening - Kratos will eventually die and from his death, a new trilogy will stem, only this time, Atreus will take centre stage as the endless cycle of death repeats once more. Kratos has always been good at surviving. He's climbed out of Hades and back to the realm of the living so many times that I've lost count, but dying in a new realm with Gods and lore unfamiliar to him? I'm not so sure. To escape Hades is one thing, but to escape Valhalla? Of all the places Kratos could find himself, Valhalla seems the most deserving destination for a warrior such as he. It's the realm of fallen heroes and what better place for Kratos during his final send off? 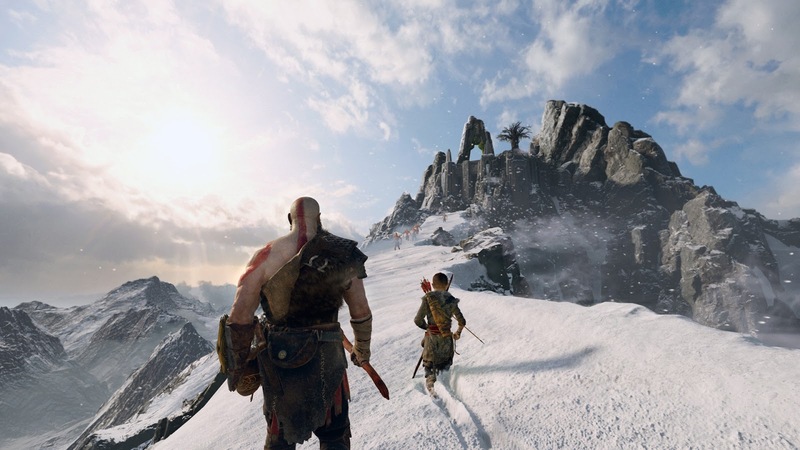 It's unclear where in the nine worlds of Norse mythology this latest instalment of God of War will be set and at first glance, I thought the snow covered landscape could have been Niflheim, but according to the images on the official website here, it's actually Midgard. Also, connecting Midgard and the other eight worlds is the Tree of Life, Yggdrasil. Though the tree itself has yet to be revealed, it could have quite feasibly provided an entry for Kratos, making it possible for such an outsider to invade this realm. Still, it's highly unlikely the Norse Gods would approve of this. Featured in the two trailers above are Jormungand (The World Serpent) and Fenrir (the talking Wolf). Though there's no sign of Hel, this can only mean one thing - Loki, The God of Trickery, will play his part in Kratos and his son Atreus' brand new adventure. Why? Loki had three children - Fenrir, Jormungand and Hel. If his offspring are here, you can bet your fine selves that Loki won't be far behind and where there's Loki, the likes of Odin, Freyr and Thor are sure to follow. 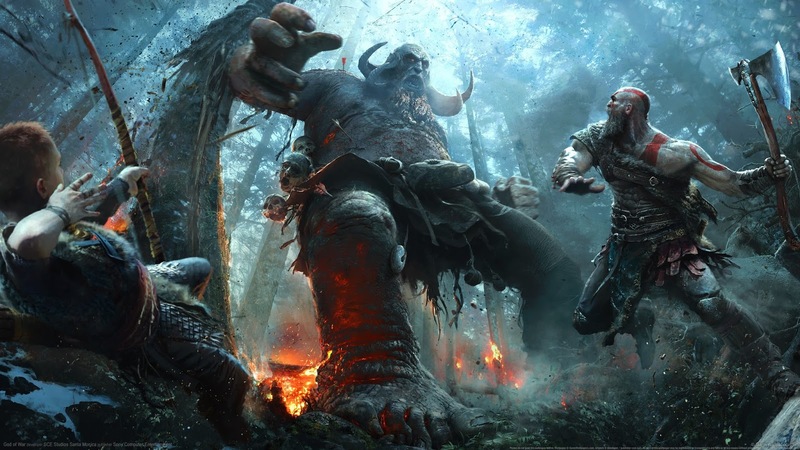 Interestingly enough, Elves, Dwarves and Giants play a big part in Norse mythology and although there's currently no sign of any Elves (from what I can tell, though the creatures Kratos kills could always be Dark Elves), Dwarves and Giants are certainly seen in the above footage. Upon inspection, the brief scene of a room filled with golden treasure and a Greek looking pot (portraying Kratos) on a pedestal in the middle can mean one of two things - 1. That room is a Dragon's lair (in a lot of mythology, Dragon's are sentient beings that are highly intelligent, quite often more so than humans and their life long ambition is to live surrounded by treasure and to have control over cities of people, or any beings they deem lesser than themselves). 2. That room is a Dwarven treasury. Dwarves love treasure. They'll do almost anything for gold and their smithing abilities are often seen as so advanced that even the Gods themselves have been known to have them craft magical items and weapons, sometimes just to admire the craftsmanship alone. To give you an idea of their abilities, they were responsible for creating Thor's hammer, Mjollnir. The little guy in the gold armour is without a doubt a Dwarf and could even be the one who made or gave Kratos his magnificent Axe to begin with. Lastly, the nine worlds I previously mentioned are Niflheim (world of mist and fog - a very icy region), Jotunheim (home of the Giants), Alfheim (home of the Light Elves), Svartalfheim (home of the Dwarves), Muspelheim (world of fire), Vanaheim (home of the Vanir - An old branch of magical Gods), Helheim (home of Loki's daughter Hel and the resting place for the dishonourable dead), Midgard (home of the humans) and Asgard (the home of most Gods and where Valhalla, the Hall of Heroes resides). It's unclear which of these worlds will be present in the upcoming re-imagining of God of War, but it looks as though Midgard is currently the only confirmed location. It is said that when Ragnarok occurs, there will be just two humans left to re-populate the world while the last few remaining Gods are recuperating from their losses. If the events of God of War lead up to and include the foreseen battle of Ragnarok, this would most likely mean Kratos' son Atreus had found a lover, during or after his fathers departure from the world of the living and would most likely end up being one of the two last humans to bring back humanity from the brink of extinction. 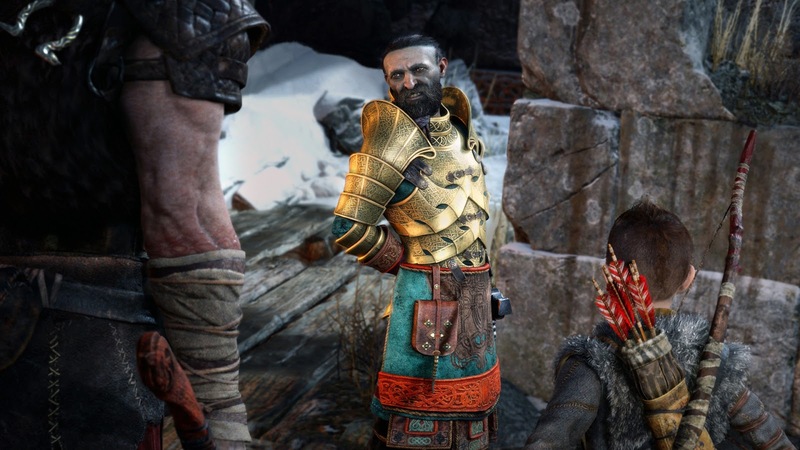 It's clear to see that unlike his father, Atreus is a well intended boy, so would he express the love and compassion so absent from his father, or will his fathers bloodlust and heavily tainted essence be enough to put Atreus on a similar path? There's a lot to discover here and if the Gods and Giants don't kill each other first, I'm sure Kratos and his son will mop up just fine together. Below, you can watch a fairly informative behind the scenes talk with Cory Barlog (Director of God of War 2 onwards) accompanied by several members of his team and in it, it's confirmed that this will be set in a pre-Viking era. Plus, the actor of Teal'c from Stargate SG-1 is the new voice and motion capture artist for Kratos and honestly, I couldn't hear the difference in his voice. He sounds right for the role, even if I'm a little saddened that Terrence C.Carson won't be reprising his role. Now that I've given you a little insight into the known Norse mythology and what we should come to expect regarding the next chapter of God of War, let's talk a little about the gameplay and how it's changed from previous titles. God of War has always been fast, brutal and relied heavily on QTE's (Quick-Time Events). The upcoming God of War at first glance is no different. It's incredibly fast, hideously brutal and there are many actions that look like QTE's, only without any sign of the button prompts fans of the series are so used to. Could this mean that there are no QTE's anymore and instead the finishing moves are built into the combo system, or were the button prompts hidden from the two currently released trailers to not break immersion or disrupt the gameplay presented? At this point it's unclear, but the gameplay is looking good. Gone are the fixed and somewhat overhead camera angles of old as we're now given a full on, behind the character perspective, placing us in full view of Kratos' overly destructive nature. This alone completely changes the dynamic of each fight, but does it do so in a negative way? I think not. This type of gameplay pulls you right up close to the barbarity of slaying your foe, intensifying the action tenfold while simultaneously achieving a fresh new take on God of Wars action, which is probably needed considering how old God of Wars standard battle system now is. Still, I can't help but shake the feeling "If it ain't broke, don't fix it", though I feel a change like this needs to at least be taken with a slight amount of caution. It's not good to let others tread on you. On the weapons front, only two weapons (excluding the bow Kratos gives to Atreus) have been revealed so far - Kratos' magical Leviathan Axe and on the defensive side, his mechanical shield. The shield itself looks Dwarven and with such a radical transformative ability, it's likely he'll pick this up from a character of the Dwarven domain along the way. As for the axe, well with its magical ice powers, its returning ability and its sheer combat effectiveness, it's probably Dwarven too. One thing's for sure - The gameplay with and without (bare-handed swings and shoulder bashes) these weapons looks to be immensely satisfying and it's abundantly clear to me that this upcoming instalment of God of War is definitely not lacking in style or scope for that matter, considering the gigantic, fallen humanoid featured within the second trailer above. The last thing I really want to mention is that the team at Sony Santa Monica have used the real Norse language, both spoken and written. Everything that has writing on it actually means something and so, if you're one of the few people who can read, write or at least understand the language, you'll understand every spoken word and piece of text scattered throughout the nine worlds of this upcoming God of War instalment. If that wasn't awesome enough already, Atreus will translate for you in-game, can aid you at the press of a button and as Cory Barlog stated in the above behind the scenes video, will also be able to do his own thing when you're off and distracted, doing what Kratos does best. They really put emphasis on the fact Atreus will serve solely as an aid and not a burden. Let's just hope they're right, as I sure hate babysitting missions! Overall, the signature style of God of War remains at its roots. The scope has once again increased tenfold (at this point I've stopped questioning if that's even possible), the acting is top notch, there are enough nods to the original series to keep fans happy and the choice to throw Kratos into the realm of Norse mythology is something I truly can't wait to see play out in full. This has got me excited for God of War once more and rekindled my love for the series after the less than satisfying prequel, Ascension and aside from the fantastic score and outstandingly beautiful visuals, for me God of War is the main game to look out for come 2018. God of War will be the eighth instalment to the series and is set to release early 2018 exclusively for Playstation 4.